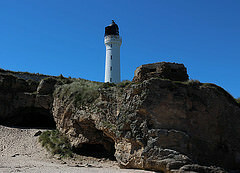 The Covesea Lighthouse is situated on the B9040; turn off at the Silver Sands Caravan Park. Right on the doorstep of the Lighthouse is a golf driving range, golf links, pitch and putt, stables and cafe as well as the facilities at the Caravan Park. As well as two beautiful beaches and a championship golf course, Lossiemouth boasts a Fisheries and Community Museum, a marina and watersports as well as many cafes, restaurants and hotels.